A lot of Nicholas Briggs' life has been caught up in the world of Doctor Who since its return in 2005. He's worked on set alongside Christopher Eccleston, David Tennant, Matt Smith and Peter Capaldi as the voice of the Daleks, the Cybermen and the Judoon. His Judoon duties also took him onto The Sarah Jane Adventures and he appeared on screen as ruthless government crisis advisor Rick Yates in Torchwood: Children of Earth. He featured on stage as Winston Churchill (and many other characters) in the UK arena tour of Doctor Who Live. 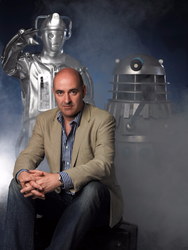 He is also the executive producer of Big Finish Productions (who produce audio drama based on Doctor Who, The Prisoner, Blake's 7, Sherlock Holmes, Survivors, Terrahawks, Dark Shadows, The Omega Factor and others) which releases well over 100 productions every year. He also writes and directs for the company, most recently working solidly on the new Fourth Doctor adventures, starring Tom Baker, Louise Jameson, Mary Tamm, Lalla Ward and John Leeson. Nick's production of Doctor Who: Dark Eyes - The Great War won a BBC Audio drama award for best online drama. Nick has acted in theatres throughout the UK, on tour, in panto and in rep. Favourite roles he's played include Larry in Closer, Count Dracula and Sherlock Holmes (which he also plays for Big Finish's highly acclaimed Sherlock Holmes audio range). He directed and created the sound design and music for all three series of the BBC Radio 4 comedy sci-fi series Nebulous (featuring Mark Gatiss, David Warner, Steve Coogan and many others) and is currently a presenter for BBC Radio 4 Extra's Seventh Dimension. Nick recently appeared in the BBC Radio 4 dramatization of Terry Pratchett and Neil Gaiman's Good Omens, in which he played Metatron (the Voice of God). Screen credits include Lewis, Torchwood and An Adventure In Space and Time on TV and the movies Adulthood and 4,3,2,1. Nick is currently writing and directing the second series of audio Doctor Who spin-off Charlotte Pollard and has just completed a brand new series of audio adventures for The Prisoner. He's also written and directed a stage adaptation of The Strange Case of Dr Jekyll and Mr Hyde which was produced at the Theatre Royal Nottingham. He's currently working on more Doctor Who scripts for Big Finish Productions.